As Paris prepares to celebrate Christmas, carousels have appeared around the city providing free rides for those who want to be whirled far away from the everyday. Sunday afternoon in the Champ de Mars – a long, green park running down to the Eiffel Tower. Dazzling winter sun in a clear blue sky. Parisians stroll with their dogs, a lady feeds the sparrows a bit of baguette and, from a small dusty corner, comes the jangling of a brass bell. Twenty carousel horses lunge forward, each with a child strapped to its saddle – wooden ears pricked, hooves raised in charging gallop, painted eyes brave and bold. Round and round they whirl – Rocky, Lucky, Zorro, Jim, Polo, Betty – spurred on by the joy of the children and the force of one Frenchman’s left arm – that of Monsieur Daniel who is breathlessly turning the hand-crank. “This carousel will be 100 years old next month,” he laughs. “Allez, les enfants, allez!” (Go, children, go!) he cries. The children clutch wooden batons in their right hands while gripping the red and yellow carousel poles with their left. They are playing the jeu de bagues (ring game) – a children’s version of the medieval tournament where galloping knights spear rings with lances. 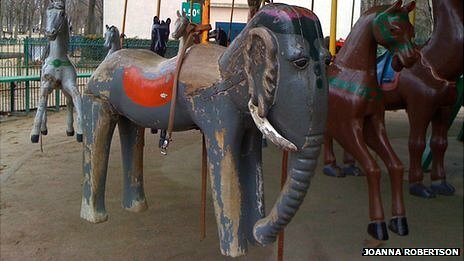 Popular since the 18th Century, it is still played at several merry-go-rounds in Paris. Metal rings dangle tantalisingly from a suspended block, as children – spinning past on wooden steeds – try to catch them on their batons. The carousel whirls, the rings chink, the onlookers cheer and the score mounts up. “J’ai huit (I have eight),” a boy cries. “Mais moi, j’ai dix (I have 10),” shouts a little girl. The jeu de bagues fascinated the German poet Rainer Maria Rilke who, while living in Paris in the early 1900s, would sit for hours in the Jardin du Luxembourg watching the carousel turn, its horses, a stag and an elephant – Rilke’s favourite – carrying children round and around, playing the ring game. At the age of 134, this carousel is now the oldest in Paris but its “stand of dappled horses” still turns almost daily, and the children still play. Rilke’s beloved elephant, once snow-white, is now grey. At the front left foot of the Eiffel Tower, on the bank of the River Seine, turns the city’s newest carousel. A French-blue, red and gold, double-decker confection in the Belle Epoque style – with horses, wild animals, fairytale carriages and spinning teacups. Just 18 months old, it is designed to run on renewable energy. Beneath their rearing hooves, the horses have bicycle wheels so passengers can pedal to boost power. Atop the colourful canopy – lined with solar panels – a windmill whirrs, garnering every last drop of energy from the passing river breeze. It is a far cry from the hand-cranked merry-go-rounds. 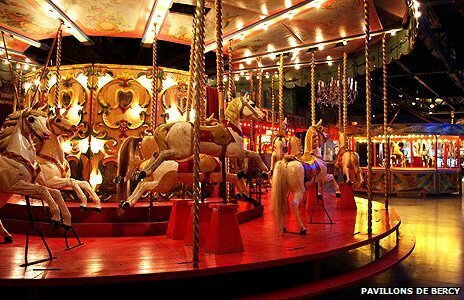 “Carousels have always been about the latest technology,” says Jean-Paul Favand, owner and curator of one of the world’s most significant collections of fairground art, the Musee des Arts Forains. “They ran on steam, then electricity,” he explains. “They brought the latest inventions – the most glamorous experiences – to the masses. Favand collects, restores and displays his extraordinary acquisitions through his museum, where all the exhibits are there to be touched, played and ridden on. Pull aside the rich, red-velvet theatre curtains that shroud its doors and enter an enchanted world of great beauty and fascination, of genuine Belle Epoque fairgrounds and tournees (travelling shows with carousel-salons) where hundreds would gather to dance, drink wine and take a turn on a glittering carousel, to be whirled far away from the humdrum everyday – be it on a dashing steed, a farmyard pig or a bi-plane. The museum throws open its doors to all in the days between Christmas and Epiphany, thronging the antique carousels with crowds of curious visitors. A favourite is always the velocipede – a bicycle carousel from 1885 which tears round at breathtaking speed, the riders pedalling furiously. Favand’s enchanted merry-go-round world lies within another – the city of Paris itself. Lit with hundreds of thousands of holiday lights and with a big wheel glittering on the Place de la Concorde, Paris has just added 20 more carousels to its 35 permanent ones. They are a Christmas gift from the mayor to citizens and visitors. Free rides from chill winter dawn until long after dusk, for adults as much as for children. Fifty-five carousels – set like whirling jewels throughout the city – each one filled with laughter and imagination.